Water willow ( Justicia americana) provides a high level of stabilization of streambeds and shorelines as it’s rhizomatous growth pattern secures the stream substrate with mass densities roots forming below the water and dense colonies above water. These colonies provide high quality shelter and habitat for numerous species of fry, juvenile, and adult fish. It also has great habitat potential for invertebrates due to its propensity for high stem densities, stem mass, and cover provided by foliage. Water willow is resilient to flooding by flattening down and forming a smooth surface that offers little resistance after a disturbance such as high water flows and velocities, returning then to a stable condition. It can also tolerate being submerged for long periods. It appears, through observation over time, that it is also resistant to goose predation (apparently it is not appealing to eat). 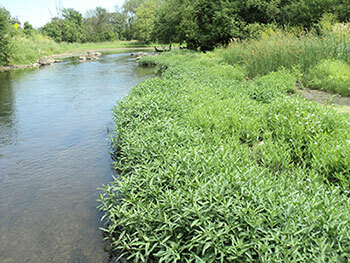 Water willow adds a more diverse habitat quality to the world of aquatic life in river restoration. Water willow ( Justicia americana) needs to be planted from the toe of the bank into the stream as far out as one wishes. It can stand ‘no water’ as long as it is within the general hyporheic zone. It can be planted underwater up to six inches and will grow outward into 2 to 2 ½ feet of water. In streams it is imperative that the plugs are placed securely into rocky, small to large cobble size substrates (not gravel, sand, or silts). Over time, silts and sands can accumulate on top of the rock/ planting zones on a depositional point bar, thus creating a ‘new’ bank zone with additional floodplain. Further, if planted in a riffle- run area, the riffles tend to ‘stay-put’ and clear of silts. A dibble bar is the preferred method of planting Water willow ( Justicia americana) into the rock, checking after that the plug cannot be pulled up out of the water by hand. A two man team is generally required. 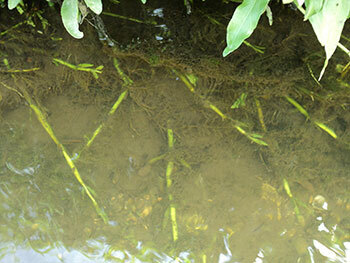 Water Willow moving into deeper water by horizontal stem growth. 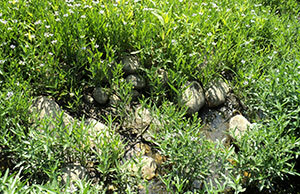 Water willow ( Justicia americana) provides the same habitat improvement qualities when planted on pond and lake shores. Benefits of an improved fishery and shore line erosion control make this plant a great choice for shoreline installation in ponds and lakes in addition to streams.